Take I-95 South to Washington, D.C.'s Capital Beltway (I-495 West). Take Exit 27 and then follow signs to Exit 25 (U.S. 1 South toward College Park). Proceed approximately one mile south on Route 1; take the exit for 193 West (University Boulevard). At the second light, turn left onto Stadium Drive. You will see Denton Hall on your left, as you enter. Follow signs posted for your summer program at the traffic circle. Continue ¾ way around the traffic circle to Valley Drive. Take the first left to continue on Valley Drive (Elkton Hall is on your left)to the stop sign. Turn right at the stop sign and continue to the end; La Plata Hall is on your right. Take I-95 North to Washington, D.C.'s Capital Beltway (I-495). Continue north on I-95/I-495 toward Baltimore. Take Exit 25 (U.S. 1 South toward College Park). Proceed approximately one mile south on Route 1; take the exit for 193 West (University Boulevard). At the second light, turn left onto Stadium Drive. You will see Denton Hall on your left, as you enter. Follow signs posted for your summer program at the traffic circle. Continue ¾ way around the traffic circle to Valley Drive. Take the first left to continue on Valley Drive (Elkton Hall is on your left)to the stop sign. Turn right at the stop sign and continue to the end; La Plata Hall is on your right. Take I-66 East or I-270 South to Washington, D.C.'s Capital Beltway (I-495). Go East on I-495 toward Baltimore/Silver Spring. Take Exit 25 (U.S. 1 South toward College Park). Proceed approximately one mile south on Route 1; take the exit for 193 West (University Boulevard). At the second light, turn left onto Stadium Drive. You will see Denton Hall on your left, as you enter. Follow signs posted for your summer program at the traffic circle. Continue ¾ way around the traffic circle to Valley Drive. Take the first left to continue on Valley Drive (Elkton Hall is on your left)to the stop sign. Turn right at the stop sign and continue to the end; La Plata Hall is on your right. Take U.S. 50 West to Washington, D.C.'s Capital Beltway (I-495). Go north on I-95/I-495 toward Baltimore. Take Exit 25 (U.S. 1 South toward College Park). Proceed approximately one mile south on Route 1; take the exit for 193 West (University Boulevard). At the second light, turn left onto Stadium Drive. You will see Denton Hall on your left, as you enter. Follow signs posted for your summer program at the traffic circle. Continue ¾ way around the traffic circle to Valley Drive. Take the first left to continue on Valley Drive (Elkton Hall is on your left)to the stop sign. Turn right at the stop sign and continue to the end; La Plata Hall is on your right. Take 16th St. North which becomes Georgia Avenue North at the Maryland/D.C. line. Go East on I-495 toward Baltimore. Take Exit 25 (U.S. 1 South toward College Park). Proceed approximately one mile south on Route 1; take the exit for 193 West (University Boulevard). At the second light, turn left onto Stadium Drive. You will see Denton Hall on your left, as you enter. Follow signs posted for your summer program at the traffic circle. Continue ¾ way around the traffic circle to Valley Drive. Take the first left to continue on Valley Drive (Elkton Hall is on your left)to the stop sign. Turn right at the stop sign and continue to the end; La Plata Hall is on your right. Take Rhode Island Avenue (U.S. 1 North) which becomes Baltimore Avenue North at the Maryland/D.C. line. Proceed through the city of College Park. Turn left at the main entrance at Campus Drive (the intersection of Route 1 and Paint Branch Parkway). Continue up Campus Drive to the traffic circle (M Circle) and follow signs posted for your summer program at the traffic circle. Continue ¾ way around the traffic circle to Valley Drive. Take the first left to continue on Valley Drive (Elkton Hall is on your left)to the stop sign. Turn right at the stop sign and continue to the end; La Plata Hall is on your right. Take I-95 South to Washington, D.C.'s Capital Beltway (I-495 West). Take Exit 27 and then follow signs to Exit 25 (U.S. 1 South toward College Park). Proceed approximately two miles south on Route 1 to the Main Entrance of the campus at the light at Campus Drive (the other side of the road is Paint Branch Drive); take a right onto Campus Drive to the traffic circle (M circle). You will go halfway around the circle and continue on Campus Drive. Just before Cole Student Activity Center, the road will split. Bear to the left to continue on Campus Drive; Queen Annes Hall will be on your left. Take I-95 North to Washington, D.C.'s Capital Beltway (I-495). Continue north on I-95/I-495 toward Baltimore. Take Exit 25 (U.S. 1 South toward College Park). Proceed approximately two miles south on Route 1 to the Main Entrance of the campus at the light at Campus Drive (the other side of the road is Paint Branch Drive); take a right onto Campus Drive to the traffic circle (M circle). You will go halfway around the circle and continue on Campus Drive. Just before Cole Student Activity Center, the road will split. Bear to the left to continue on Campus Drive; Queen Annes Hall will be on your left. Take I-66 East or I-270 South to Washington, D.C.'s Capital Beltway (I-495). Go East on I-495 toward Baltimore/Silver Spring. Take Exit 25 (U.S. 1 South toward College Park). Proceed approximately two miles south on Route 1 to the Main Entrance of the campus at the light at Campus Drive (the other side of the road is Paint Branch Drive); take a right onto Campus Drive to the traffic circle (M circle). You will go halfway around the circle and continue on Campus Drive. Just before Cole Student Activity Center, the road will split. Bear to the left to continue on Campus Drive; Queen Anne's Hall will be on your left. Take U.S. 50 West to Washington, D.C.'s Capital Beltway (I-495). Go north on I-95/I-495 toward Baltimore. Take Exit 25 (U.S. 1 South toward College Park). Proceed approximately two miles south on Route 1 to the Main Entrance of the campus at the light at Campus Drive (the other side of the road is Paint Branch Drive); take a right onto Campus Drive to the traffic circle (M circle). You will go halfway around the circle and continue on Campus Drive. Just before Cole Student Activity Center, the road will split. Bear to the left to continue on Campus Drive; Queen Anne�€™s Hall will be on your left. Take 16th St. North which becomes Georgia Avenue North at the Maryland/D.C. line. Go East on I-495 toward Baltimore. Take Exit 25 (U.S. 1 South toward College Park). Proceed approximately two miles south on Route 1 to the Main Entrance of the campus at the light at Campus Drive (the other side of the road is Paint Branch Drive); take a right onto Campus Drive to the traffic circle (M circle). You will go halfway around the circle and continue on Campus Drive. Just before Cole Student Activity Center, the road will split. Bear to the left to continue on Campus Drive; Queen Anne�€™s Hall will be on your left. Take Rhode Island Avenue (U.S. 1 North) which becomes Baltimore Avenue North at the Maryland/D.C. line. Proceed through the city of College Park. Turn left at the main entrance at Campus Drive (the intersection of Route 1 and Paint Branch Parkway). Continue up Campus Drive to the traffic circle (M Circle); You will go halfway around the circle and continue on Campus Drive. Just before Cole Student Activity Center, the road will split. Bear to the left to continue on Campus Drive; Queen Anne�€™s Hall will be on your left. Take I-95 South to Washington, D.C.'s Capital Beltway (I-495 West). Take Exit 27 and then follow signs to Exit 25 (U.S. 1 South toward College Park). 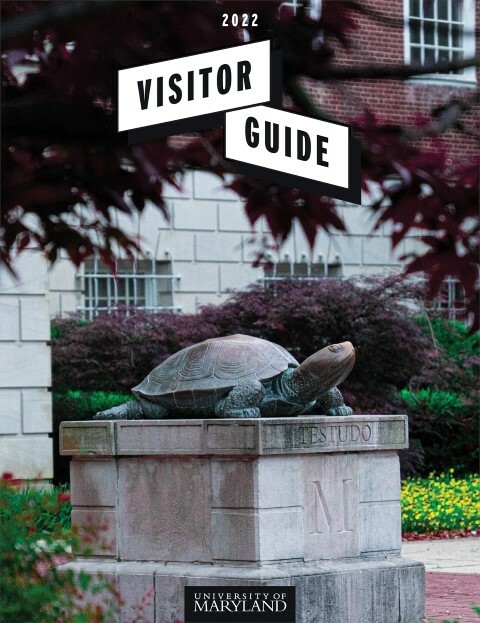 Proceed approximately 2.5 miles south on Route 1 (past the Visitor Center) to the south gate entrance to the campus at the light at Regents Drive (the other side of the road is College Ave.); take a right onto Regents Drive; Annapolis Hall is on your left. Temporary parking for check in is available in the parking lot in front of Annapolis Hall. Take I-95 North to Washington, D.C.'s Capital Beltway (I-495). Continue north on I-95/I-495 toward Baltimore. Take Exit 25 (U.S. 1 South toward College Park). Proceed approximately 2.5 miles south on Route 1 (past the Visitor Center) to the south gate entrance to the campus at the light at Regents Drive (the other side of the road is College Ave.); take a right onto Regents Drive; Annapolis Hall is on your left. Temporary parking for check in is available in the parking lot in front of Annapolis Hall. Take I-66 East or I-270 South to Washington, D.C.'s Capital Beltway (I-495). Go East on I-495 toward Baltimore/Silver Spring. Take Exit 25 (U.S. 1 South toward College Park). Proceed approximately 2.5 miles south on Route 1 (past the Visitor Center) to the south gate entrance to the campus at the light at Regents Drive (the other side of the road is College Ave.); take a right onto Regents Drive; Annapolis Hall is on your left. Temporary parking for check in is available in the parking lot in front of Annapolis Hall. Take U.S. 50 West to Washington, D.C.'s Capital Beltway (I-495). Go north on I-95/I-495 toward Baltimore. Take Exit 25 (U.S. 1 South toward College Park). Proceed approximately 2.5 miles south on Route 1 (past the Visitor Center) to the south gate entrance to the campus at the light at Regents Drive (the other side of the road is College Ave.); take a right onto Regents Drive; Annapolis Hall is on your left. Temporary parking for check in is available in the parking lot in front of Annapolis Hall. Take 16th St. North which becomes Georgia Avenue North at the Maryland/D.C. line. Go East on I-495 toward Baltimore. Take Exit 25 (U.S. 1 South toward College Park). Proceed approximately 2.5 miles south on Route 1 (past the Visitor Center) to the south gate entrance to the campus at the light at Regents Drive (the other side of the road is College Ave.); take a right onto Regents Drive; Annapolis Hall is on your left. Temporary parking for check in is available in the parking lot in front of Annapolis Hall. Take Rhode Island Avenue (U.S. 1 North) which becomes Baltimore Avenue North at the Maryland/D.C. line. At the intersection of Regents Drive and College Ave., turn left at the south gate entrance to campus onto Regents Drive. Annapolis Hall is on your left. Temporary parking for check in is available in the parking lot in front of Annapolis Hall.